The winners of the strokeplay competition at Balla Golf Club sponsored by Roches Centra - Balla. 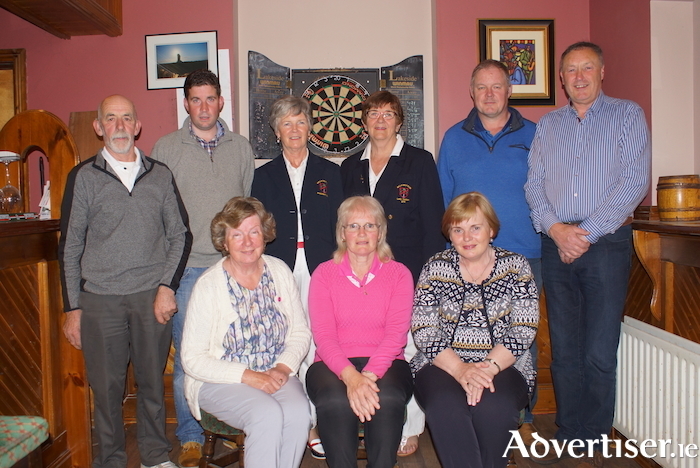 Back row: PJ Brett, Ronan Mahon, Carmel Henry (president), Julie Loftus (Lady Captain), Mick Mellett and John Nally. Front row: Delia O'Hara, Aine MhicSuibhne and Helen Byrne. It was another great weekend for golfers around the county last weekend and they returned some great scores. Geraldine O'Malley was the winner of the Lady Captain's Prize (Julie Loftus ) in Balla last weekend. She came home with the win after she carded 106 over her two rounds, second place went to Mary Brett, and the gross prize was claimed by Anne Marie Doherty. The rest of the top seven was made up of Mary Gillard, Kathleen Minogue, Delia O'Hara, Geraldine Evans, and Margaret Forkan. The first 18 competition was won by Patrica Larkin, and Aisling Killeen was the second 18 winner. The past captain's prize went to Patricia Conwell - who also claimed the closest to the pin prize. The men's competition was won by Lorcan Cribben, with John Nally finishing in second spot, and the gross prize going to PJ Brett. Pat Mohan finished in third place with John Walsh coming home in fourth spot. The nearest the pin prize went to Martin Moylette. The ladies' competition last weekend was won by Helan Healy with a score of 40pts, the category prize wins went to Emer Ferrick, Antoinette O'Connor, and Sarah Staunton. The front nine prize went to Nono Duggan for her score of 23pts and the back nine was claimed by Geraldine Kavanagh who scored 23pts. The gents' open competition was won by Joe Kearney with a score of 39pts, second place was claimed by Tom Ferrick, and Andrew Hickey was the gross prize winner. The qualifiers from the day were Christopher Mellett, Barry Loftus, and John Nalty. The gents' weekend competition was a fourball betterball that was won by Paul Walsh and Cormac Murphy, second place went to the duo of Declan Tierney and Gabriel Coppinger. The front nine was won by the pair of Enda Staunton and James Gaynor, and the back nine went to the team of Gary Brett and Stephen Conroy. Kevin Garvey was the winner of the gents' competition in Ballyhaunis last weekend with a round of 63, second place went to Tomas Murphy and the gross prize went to Paul Hickey. The ladies' competition was won by Deirdre Roberty after her round of 63, Norrie Dillion finished in second place and Anne Freeley came home in third spot. The draw for the Autumn Cup, the club match play singles championship has been posted in the clubhouse with 64 players taking part. Round one matches need to be played before end of July. Shane McDermott and Micheal Moran booked their place in the semifinal of the Allergan Club fourball with a narrow win over father and son combination James and Eoin Prendergast. Holders Michael Joyce and Denis Gallagher were knocked out by Seamus Hyland and Jack O’Hara after their game went down the 19th, where Jack sank his birdie putt for a memorable victory. Oliver Finnerty was the winner of the VS Par competition on Sunday. He finished with four up while Paul Gavin recorded three up for second. Vinnie Gannon had to to settle for third on two up. Lady Captain Nuala Hopkins hosted her Captain's Day competition last weekend and the winner was Margaret Moran who shot a round of 64 to claim her second Captain's Prize. The gents' nine hole competition on the day was won by Shane McDermott. In last weekend's ladies' stableford competition Carol Redding was the winner with 52pts, second place went to Carmel Timony who scored 38pts. This coming weekend it is Lady Captain's Day (Mary Horkan ). Last weekend also saw the gents' club team lose out narrowly 3-2 to Carrick-on-Shannon in the Connacht Junior Cup. The overall winner of the gents' club competition last weekend was Ray Moran with a round of 68 - the category winners were Sean Hoban, Tom F Walsh, and Tom T Reilly with the gross prize going home with Liam Halpin. Cáirde Crann Mór, Ballinrobe, is holding the Seamus Langan Perpetual Golf Competition in Ballinrobe Golf Club on Thursday July 26 in support of Western Care Association local services. Tee times are available from 8am to 5pm; entry costs €20 per person and €10 for Ballinrobe Golf Club members. Booking is available from Ballinrobe Golf Club on (094 ) 9541118. All proceeds will go to support Western Care Association local services in the Ballinrobe area. Page generated in 0.1028 seconds.